LOS ANGELES (AP) The Los Angeles Lakers were locked in to deliver their best effort of the season. The Detroit Pistons were anything but ready, and the gap between the two mindsets was obvious. 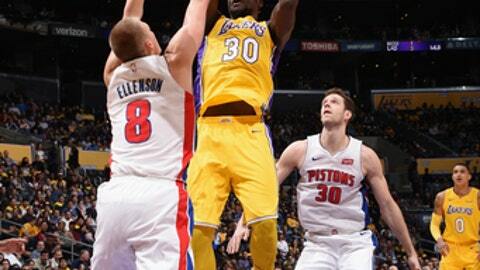 Julius Randle scored 17 points, Lonzo Ball added 13 and the Lakers smashed the Pistons 113-93 on Tuesday night. Pistons head coach Stan Van Gundy was unsure about how his team might handle the adulation associated with a surprising 5-2 start, and those concerns proved to be well-founded in a loss he described as a ”humbling experience. The Lakers used a 16-5 run in the first quarter to take a lead they would never relinquish, eventually jumping out in front by as many as 23. Another superb defensive effort keyed the win, as the Lakers allowed three free-throws, the fewest in a game in franchise history. Larry Nance Jr. had 14 points and 12 rebounds for his third double-double for the Lakers, who had lost the previous three games against the Pistons. Kentavious Caldwell-Pope had 13 points in his first chance to play against the Pistons, who drafted him No. 8 overall in 2013. Tobias Harris and Reggie Jackson each had 18 points for the Pistons, who were unable to sweep their three-game California road trip. Andre Drummond had 10 points and 12 rebounds. Ball had a modest statistical performance, finishing with six rebounds and three assists, but Lakers head coach Luke Walton credited him with setting the tone. Ball was aggressive in attacking the paint to create an easy shot for himself or a teammate, and that unselfishness became infectious. Seven Lakers finished with double figures, and six had at least three assists. Pistons: After allowing 24 fast-break points in their first seven games, the Pistons allowed the Lakers to get free for 17 points. . Ish Smith had 12 of the Pistons’ 30 points off the bench. .
Lakers: Rookie Kyle Kuzma finished with 16 points, scoring 10 points of the Lakers’ 33 points in the second quarter. . Los Angeles improved to 14-4 against the Pistons at Staples Center. Randle is thriving as an impact substitution this season. He showed it again by pacing the team in scoring despite playing just 17:25, the lightest workload for any Laker that finished with at least 10 points. Van Gundy credited the second-unit pairing of Randle and Kuzma for effectively putting the game out of reach in the second quarter. Caldwell-Pope said the Lakers were so successful because they were having fun, and he certainly did against his former team. Pistons: Host the Milwaukee Bucks on Friday to open a five-game homestand. Lakers: Visit the Portland Trailblazers on Thursday.